It looks like Friday will bring mild relief after a day of hefty stock market losses. U.S. stock futures were all edging up by roughly 0.2%, after the markets took a big tumble in the previous trading session. The Dow Jones industrial average posted its biggest drop in almost two months on Thursday, its second-straight double-digit point decline. 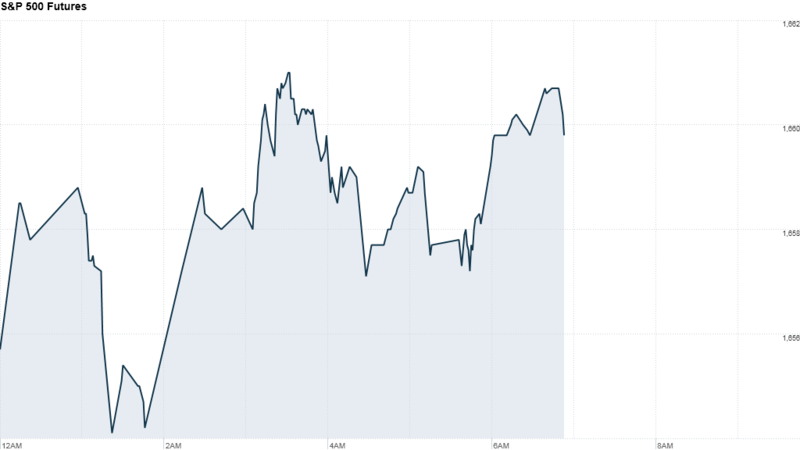 "After big moves yesterday, the market is limping into the weekend," said Marc Chandler, strategist for Brown Brothers Harriman, who described the "modest gain" in premarket trading as "inconsequential." "There's like an eerie calm settling over the markets," he said. "Traders are a bit shell-shocked, given the magnitude of the losses yesterday." On Thursday, indexes were dragged down by disappointing earnings from Wal-Mart (WMT) and Cisco (CSCO). There is also a growing concern among investors that central banks -- particularly the U.S. Federal Reserve -- will start easing back on their ultra-loose monetary policies sooner rather than later. It's been a rough week for stocks, stymied by concerns that the government will eventually taper the $85 billion worth of monthly bond buying that has helped to prop up the economy. The S&P 500 and Dow Jones industrial average have dropped about 2% so far this week and the Nasdaq is down more than 1%. Looking ahead to the trading day, investors are waiting on the Census Bureau, which will release data on July housing starts and building permits at 8:30 a.m. ET. Economists surveyed by Briefing.com expect housing starts to have risen in July to an annualized rate of 855,000 and permits to have risen to a rate of 925,000. Dell (DELL) reported solid quarterly results after the close Thursday, though shares fell slightly in after-hours trading. The company's future is still in limbo as founder Michael Dell attempts to take it private. Nordstrom (JWN) shares sank in after-hours trading Thursday after the upscale department store chain offered weak guidance. European markets suffered alongside U.S. indexes Thursday, and were mostly lower in morning trading on Friday, though the CAC 40 in Paris was little changed. Asian markets went on a wild ride, triggered by a possible trading error in Shanghai that sent China's marquee index soaring before momentum reversed. The Shanghai Composite index ended with a 0.6% loss. Stocks in Hong Kong were flat and Japan's Nikkei lost 0.8%.